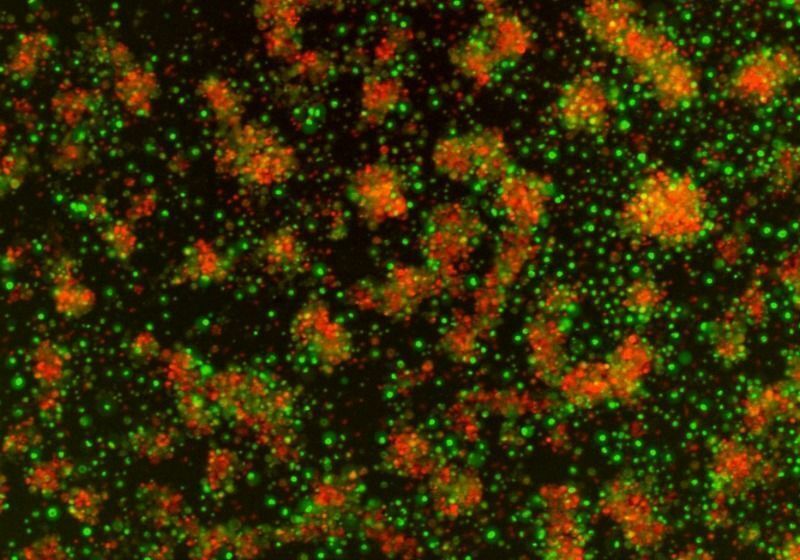 CAR-expressing, stem-cell–derived natural killer cells destroy mesothelin-expressing tumor cells from mice, programmed to fluoresce red when they’re intact and green when they are killed. CAR-T therapies—genetically engineered T cells that destroy cancer cells—have proven to be promising options when other treatments fail. However, there’s currently no one-size-fits-all CAR T, and each patient needs his own bespoke intervention. Now, researchers report that natural killer cells, grown from human induced pluripotent stem (IPS) cells and modified in a similar way to CAR-T cells, are effective against ovarian cancer in a mouse model. 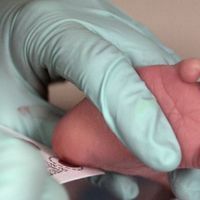 The result paves the way for developing an “off the shelf” immunotherapy that doesn’t need to be personalized for each patient, the authors report in a study published last week (June 18) in Cell Stem Cell. For Lewis Lanier, leader of the University of California, San Francisco’s cancer immunology program who was not involved in the study, the findings serve as a proof of concept, “that you can take the IPS cell and actually get a product out of it,” he says. Natural killer (NK) cells, which play an important role in tumor surveillance, offer a key advantage over T cells in that they kill some cancer cells without requiring tumor-specific cell-surface receptors, meaning they can work in many patients, explains Dan Kaufman, lead author of the study and the director of cell therapy at the University of California, San Diego, School of Medicine. “My NK cells will kill your tumor cells, and vice versa,” he says. There needs to be a little bit more caution before applying them [clinically], or saying that they’re better. 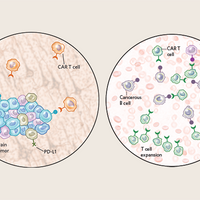 CAR-T cell therapies are built by harvesting a patient’s T cells and genetically modifying them to produce so-called chimeric antigen receptors (CARs) that direct them to destroy cancer cells. Two such immunotherapies were approved last year. 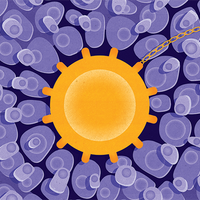 Unmodified NK cells isolated from peripheral blood or umbilical cord blood have also been shown to be effective against acute myelogenous leukemia in several clinical trials, and a few trials testing NK cells equipped with CARs in other forms of blood cancer have begun. But developing a means of deriving NK cells from stem cells would allow researchers to generate “hundreds of thousands of doses that are standardized,” Kaufman explains. Kaufman has research funding from and serves as a consultant to Fate Therapeutics, a biopharmaceutical company that develops cell immunotherapies. The researchers designed nine CAR constructs to target mesothelin, an antigen expressed in many human cancers. After testing the CARs’ efficacy in destroying cancer cells in vitro, they selected the most effective constructs, expressed them in iPS cells, and differentiated these into NK cells. Kaufman’s team created the mouse models by transplanting human ovarian cancer cells into mice whose immune systems had been suppressed to prevent them from rejecting the human cells. The scientists then infused the CAR-NK cells into the animals, and for comparison, did the same for CAR-T cells. The investigators monitored the tumors using bioluminescent imaging. They noted that the mice treated with the iPSC-derived CAR-NK cells and those treated with CAR-T cells both had shrunken tumors after 21 days compared to control mice, which had received infusions of NK cells without CAR constructs. Kaufman was surprised to find that, compared to the mice treated with CAR NKs, the animals that had received the CAR-T cell treatment appeared to be in worse shape: they had damage in organs such as the liver, lungs, and kidneys and an increase in inflammatory cytokines. “The mice that got the CAR-T cells actually wound up getting sick, losing weight, and getting these toxicities, whereas the CAR-NK-cell–treated mice didn’t,” Kaufman says. “NK cells don’t seem to have the toxicity as the CAR-T cells,” he adds, speculating that NK immunotherapies may be safer than CAR-T therapies, which sometimes cause adverse side effects that involve increased levels of cytokines in the blood of patients. Beatriz Martín Antonio, a postdoc at Josep Carreras Institute and the August Pi i Sunyer Biomedical Research Institute in Spain, isn’t convinced the results suggest that CAR NKs are safer. She suggests that the toxicities could have been due to the human T cells attacking the mouse immune system, because of species-specific differences. The same experiments ought to be repeated with CAR-expressing cells engineered from mice, she adds. Kaufman, who has filed a patent related to the study, says he is working with Fate Therapeutics to translate this approach of iPSC-derived CAR-NK cell therapy into the clinic for the treatment of ovarian and breast cancers. Y. Li et al., “Human iPSC-derived natural killer cells engineered with chimeric antigen receptors enhance anti-tumor activity,” Cell Stem Cell, doi:10.1016/j.stem.2018.06.002, 2018.